You will need Node 6+ installed on your machine. Some knowledge of Node and React will be useful. 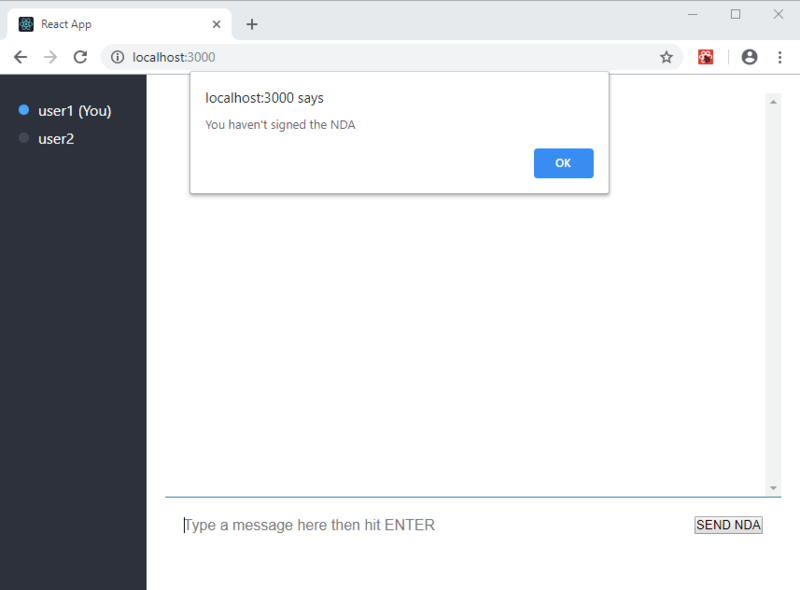 In this tutorial, we are going to build a chat application where the users cannot send messages until they sign a non-disclosure agreement (NDA) electronically. In some industries, a common requirement is to protect the confidentiality of the information disclosed between two parts. One way to implement this requirement is by using secure and legally-binding electronic signatures. The chat application is built using React and Chatkit. 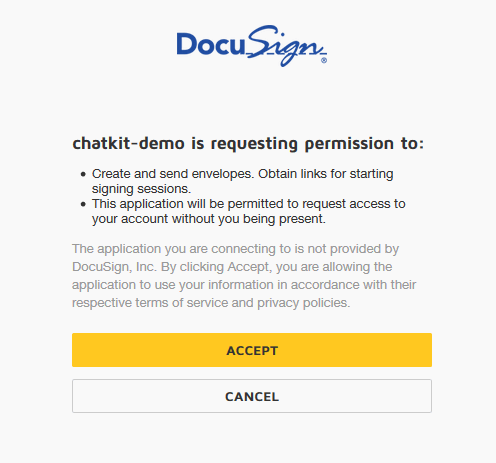 On the server-side, the Node.js SDKs of Chatkit and DocuSign are used. We’ll also use localtunnel to expose the server so DocuSign can call the webhook when the document has been signed. 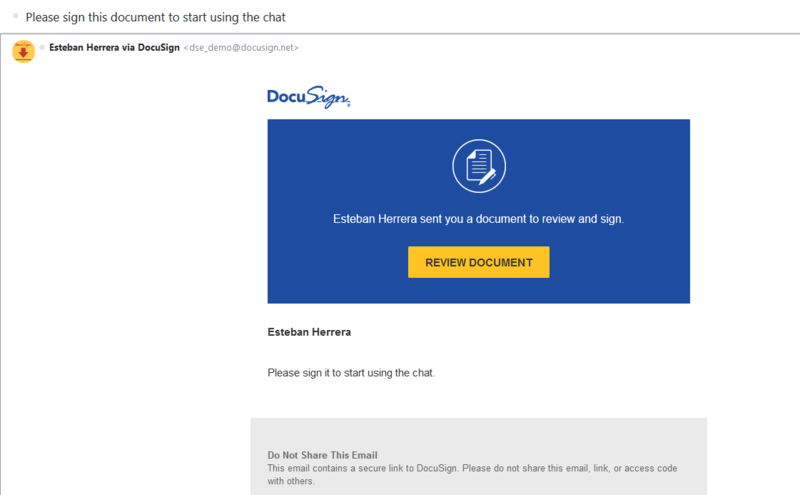 The tutorial will focus on the integration between Chatkit and DocuSign, so for the chat application, we’ll start from an adapted version of the chat app built by Alex Booker in this video tutorial. If you want to know more about building chats with Chatkit, you can follow that tutorial. However, for reference, the entire source code for this project is available on GitHub. Let’s start by creating a Chatkit application. Create a free account for Chatkit here and log in. 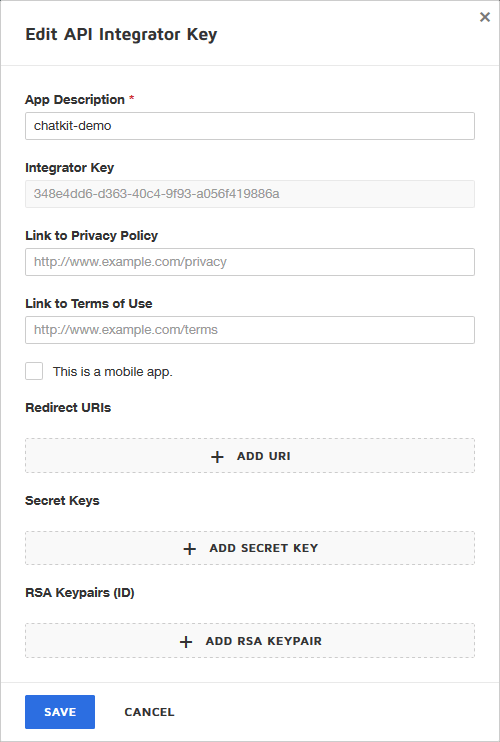 In your dashboard, create a new Chatkit instance and then, take note of your Instance Locator identifier and Secret Key from the Credentials section, we’re going to need them later. 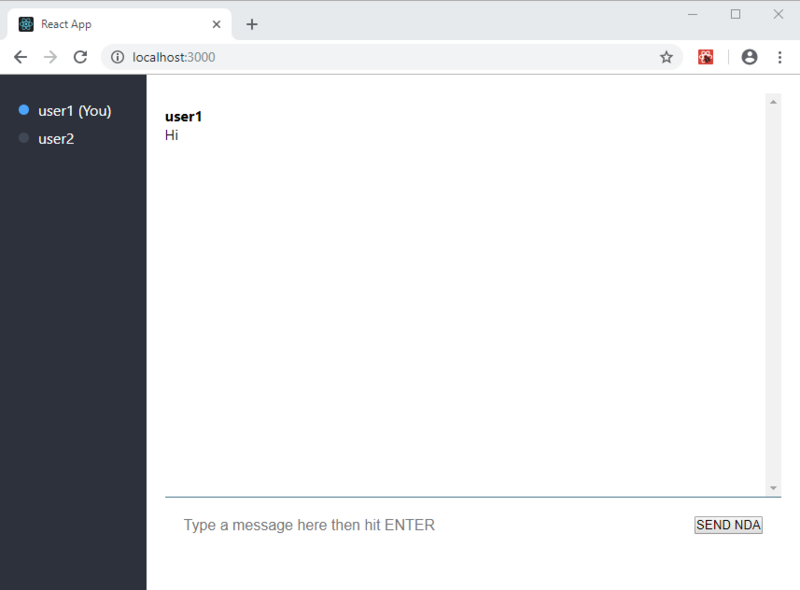 To keep things simple, I’m going to create two users and a room for the chat using the dashboard instead of using the API or the Node.js Server SDK. You don’t need to add the other user to the room. Chatkit will add it automatically the first time a user uses the chat. And that’s all the configuration we need for Chatkit. Now let’s set up the chat application. Clone the starter project from this GitHub repository. In a terminal window, cd into the project’s directory and execute npm install to download the dependencies of the project. And in src/ChatScreen.js replace your Chatkit room ID. placeholder="Type a message here then hit ENTER"
This method will call the /sign/:userID endpoint on the server to initiate the process of sending the NDA document to the user’s email. Now the only thing is left is to modify the way messages are posted. But we need to send the messages from the server to be able to allow the user to send messages only after signing the NDA. And now this method will call the endpoint /message/:roomID/:userID to send the message using the Chatkit API from the server. Let’s build the server for the application. And at the root of the directory, create the file server.js. We’ll use this array as our user database. Right now, we are going to configure two endpoints. Using the ID received in the request, we search the user in the users’ array and if it is found, using the Chatkit Node.js server SDK, we create an authentication token that is saved in the user’s object. Otherwise, an error is sent to the client. At the time of this writing, the server SDK doesn’t have a function to send the message like the client SDK, so we have to call the Chatkit API directly (but only if the hasSigned flag is set). Now before continuing building the server, let’s set up our DocuSign account. First, sign up for a free developer sandbox account. A Redirect URI. Anyone will do, for example, https://www.docusign.com. An RSA key pair. Be sure to copy your keys to a safe location because they will not be displayed again (including the ----BEGIN RSA PRIVATE KEY---- and ----END RSA PRIVATE KEY----- lines as part of the text). For applications like the one of this tutorial, JSON web tokens are the most appropriate option. This method works by impersonating a user to make API calls, so the user has to grant permissions for this. For a production environment, you must use a base URI of https://account.docusign.com/oauth/auth rather than https://account-d.docusign.com/oauth/auth. The redirect URI must exactly match the one entering when adding the Integrator Key. You only have to do this once (as long as you don’t revoke the permissions). Now the only thing missing in the configuration is creating the template for the document the users will sign. 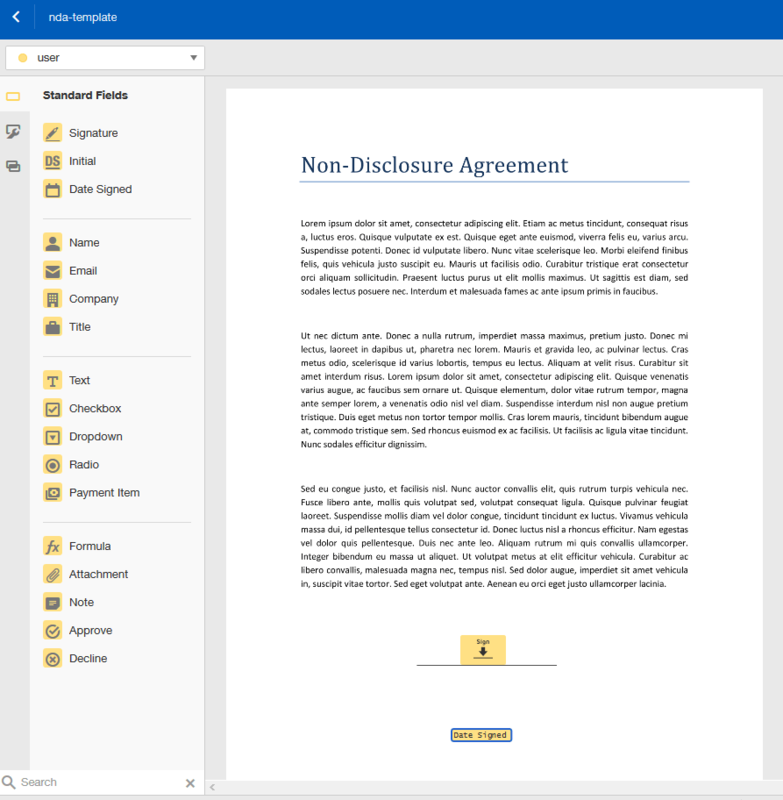 Either create a PDF document or use this sample document. When you’re done, on the upper right corner click on the Save and Close button. 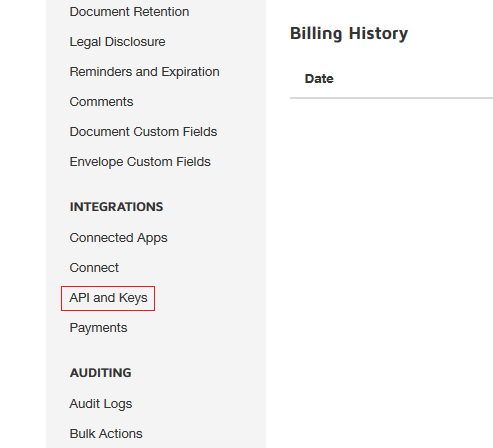 And now we’re ready to integrate the DocuSign API to the server. Next, we need to copy the private key of our Integrator Key into the file keys/docusign_private_key.txt (the value of the constant PRIVATE_KEY_FILE). Set the events for which DocuSign will call the webhook of our server. In this case, when the document is sent and completed. 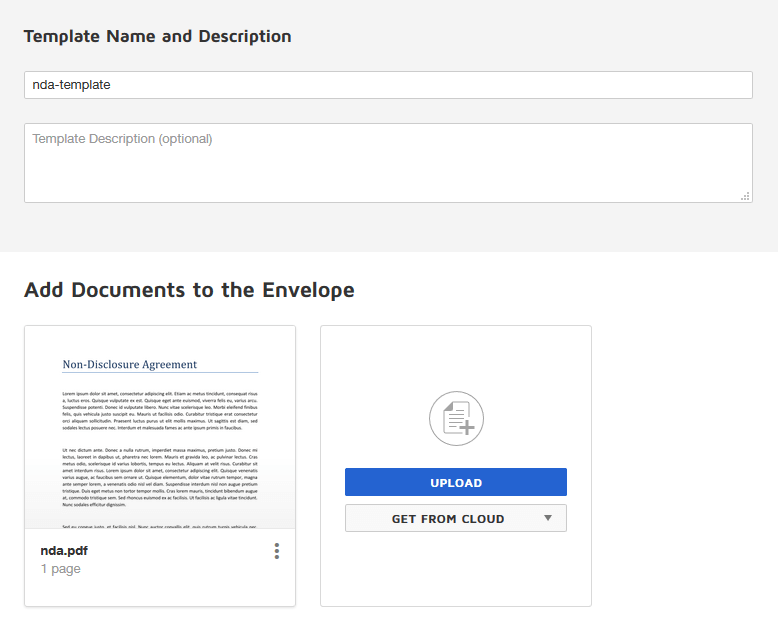 Create the envelope object to get the signature request and set the properties for the email, template, notifications, and status (must be sent). Otherwise, send an error to the client. The webhook receives the information of the event in XML format. 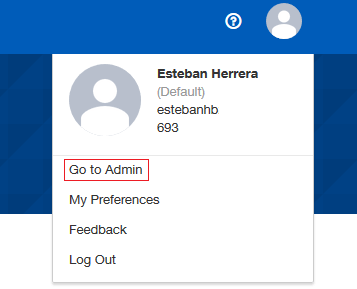 We just need to look up for the Status field and if it has the value Completed, using the signer’s email, update the hasSigned flag in the users’ array. If the login process is successful, the Express server is started on port 3001. Start the application and the server with npm start. To install or update localtunnel. To expose your local server to the world (change your subdomain if needed). Now enter the chat application and click on the Send NDA button. > concurrently "node ./server.js" "react-scripts start"
In the chat application, you should be able to send messages. In this tutorial, you have learned how to use the Chatkit Node.js server SDK to authenticate users and Chatkit’s API to post messages applying custom business logic. 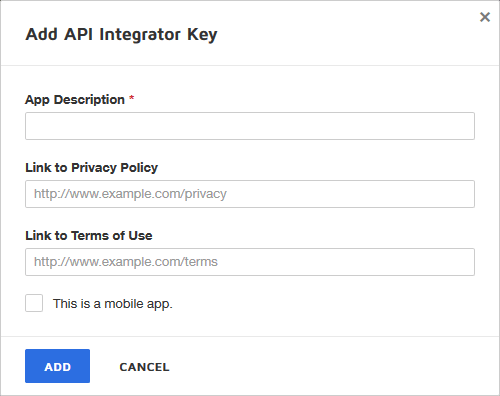 About Docusign’s API, you have learned how to authenticate using JSON Web Tokens, configure a template, send a signature request using templates, and configure webhooks to receive event notifications. 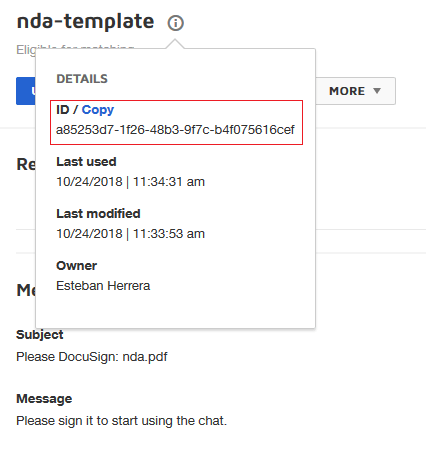 Disabling the Send NDA button once the user has signed the document. Configure another user in Chatkit, something like a bot, to notify the users the moment they can start sending messages. Improve the design of the chat. Use DocuSign APIs in more creative ways. For example, create a document with the chat messages (instead of using a template) and send it to the participants of the chat for signing. Remember that you can find the entire source code of the project on this GitHub repository.